Home Book Reviews CAN A GREAT VINAIGRETTE SAVE A MARRIAGE? Some food writers achieve success beyond recipes and cookbooks. MFK Fisher. (1908-1992) for example, earned a place among the great American authors (How To Cook a Wolf, The Art of Eating, Consider The Oyster…). Nora Ephron (1941-2012), is another (Silkwood, I Feel Bad About My Neck, When Sally Met Harry, Sleepless in Seattle, Julie and Julia…). Her semi-autobiographical novel, Heartburn (1986), is the painful-to-read, but hilarious account of the end of her second marriage; the story revolves around a stolen wedding ring and a recipe for salad dressing. After Nora’s fictionalized self, Rachel Samstat, discovered that her husband was in love with someone else, she suspected that he only stayed with her because she wouldn’t tell him how to make her famous vinaigrette. “Even now, I cannot believe Mark would want to risk losing that vinaigrette. You just don’t bump into vinaigrettes that good.” She eventually showed him how to make it, but only after she had given up all hope of getting him to love her again and irrevocably finalized the decision by smashing a Key lime pie in his face. The vinaigrette recipe is revealed on the next to the last page of the book. It is a gem—three ingredients and five minutes, max, start to finish. “You can never have too much butter – that is my belief. If I have a religion, that’s it,” From an NPR interview about her 2009 movie, Julie & Julia. 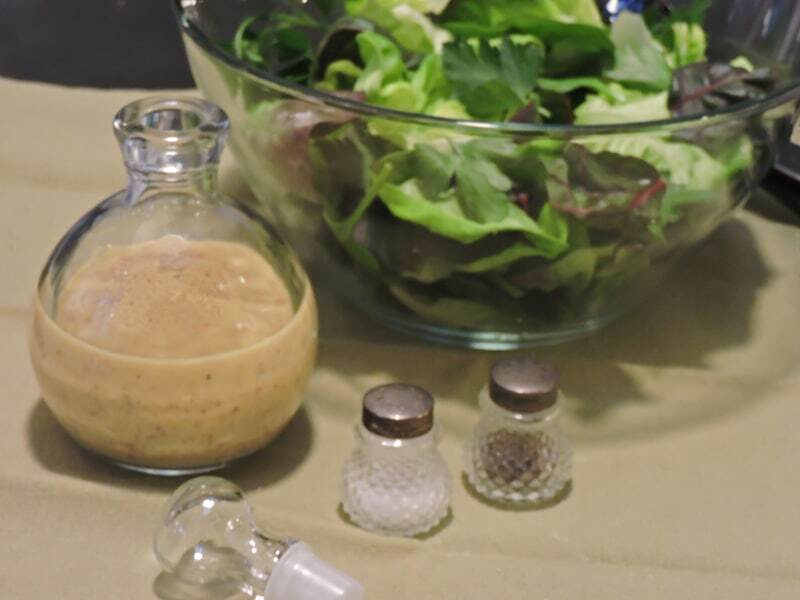 Just three ingredients and about five minutes for an amazing, home-made vinaigrette. Nora recommends serving it over gutsy greens; I find it useful for much more. Stir it into the mashed yolks along with a little chopped red onion for terrific stuffed eggs. Use it as a dip for crudities or as a sauce for roasted vegetables, chops, or steak,. It will keep without separating in the refrigerator. Mix mustard and vinegar. Add the olive oil in a thin stream, whisking constantly with a fork until thick and creamy. Food writer, mustard, Salad dressing, Simple recipe. Bookmark.